Many people suffer from migraines, a kind of storm in the brain that causes more than just headaches. I am one of those people. After I’d heard Mark Zuckerberg speak at last year’s Facebook developers conference, it occurred to me that sharing the experience might fit with his vision to give people the power to share and make the world more open and connected. I had an app done in August but got distracted for several months. Over the Christmas break, I found the time to polish it up and release it. The main feature of the app is a personal database of migraine events with the aim to helping you discover patterns or triggers. 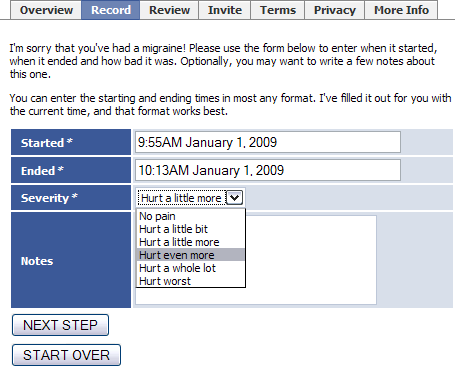 In the context of Facebook allows you to automatically let your friends know you’ve had a migraine. That could lead to better understanding or just a feeling of comfort. You can get started using the app by visiting the Migraines About Page on Facebook. One advantage in waiting was the the new template bundles for the news feed is working flawlessly. In August it was brand new and buggy. I also had more fun with the Google Chart API. Once you get a few migraines recorded, I can generate a pie chart of how severe they are and a line graph of how many you have each month.